The summer slide. It happens! The moment school lets out, my son tosses his school papers and picks up his video game remote for what HE thinks will be a totally, care-free summer. With school out, it's easy for children to lose focus on their studies. Suddenly, picking up a great book to read seems more like work and less like play. That is why I am constantly searching for fun book titles that will provoke thought, inspire new ideas and keep Kaden turning the pages. Hello, TIME FOR KIDS Big Book of Where. Have you ever wondered where electricity comes from? Or where you can find the most poisonous snake? This 192-page book, for kids 8 to 12 years old, has the answers to these questions and many more kids may never have thought to ask. In 10 chapters, which include The Oceans and Space, among others, readers will travel away from the comforts of home and jump into the seven continents, take a dive deep under the sea and venture out into the solar system. Along the way, they’ll discover some surprising facts about different customs, sports, history, and animals from around the world. We were excited to see this book on the shelf at a local bookstore. - Where is the tallest mountain? - Where did the Olympics begin? - Where is the Petrified Forest? - Where are diamonds found? - Where was the hamburger invented? - Where does spam go after you delete it? Kaden said he liked the book because of all the pictures. It helps to have a visual to go along with the words. He also said it was an easy read. The words were not difficult and the information was easy to understand. One important note from Kaden is that the TIME For Kids’ Big Book of Where has a great layout. You don't have to read page by page. You can skip all over to subjects you like. He said it also makes a great reference book. 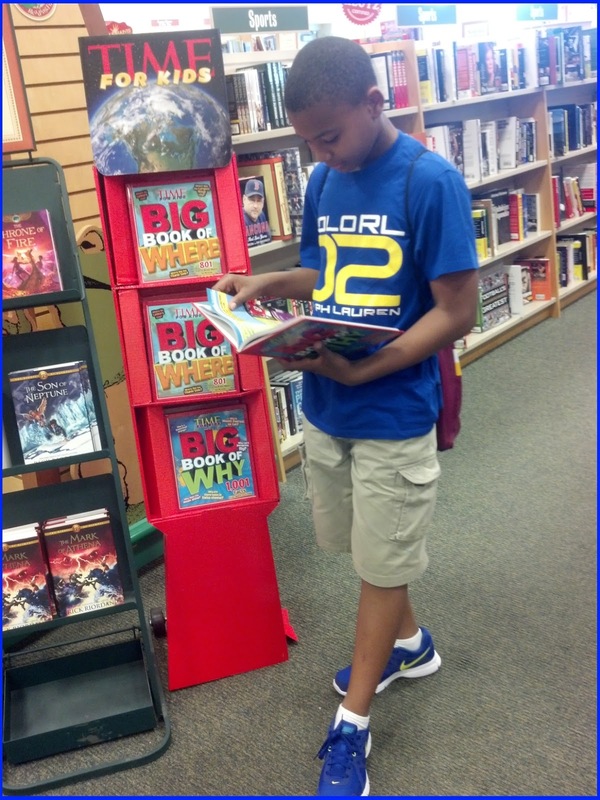 TIME For Kids’ Big Book of Where is the perfect addition to every family’s bookshelf. It's on sale today and is available at www.timeforkids.com/bigbookofwhere and retailers nationwide. TIME For Kids is a weekly classroom news magazine that motivates kids to read. Issues cover a wide range of real-world, and topics in the news kids want to learn about. 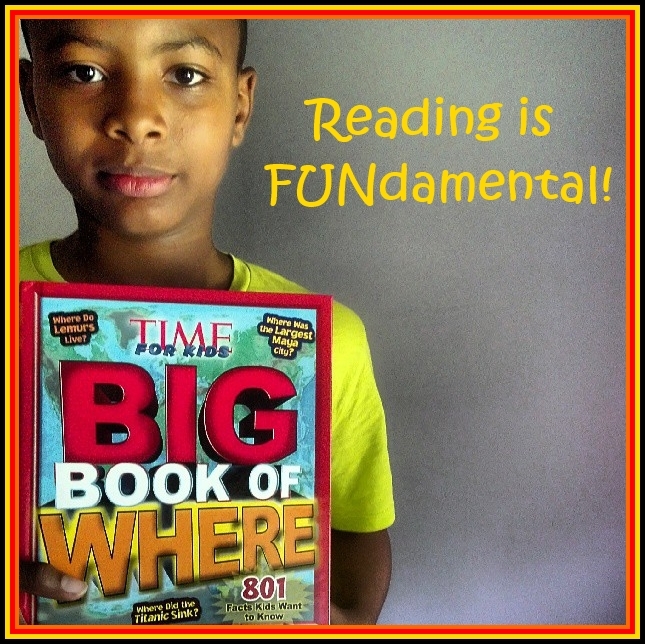 A powerful teaching tool, TIME For Kids builds reading and writing skills. About Time Home Entertainment Inc.
Time Home Entertainment Inc. (THEI), the book publishing division of Time Inc, creates and leverages editorial content across multiple platforms, including books, bookazines, e-books and calendars, in partnership with such Time Inc brands as Time, People, Sports Illustrated, Life, Fortune, Essence and Entertainment Weekly. Recent New York Times bestsellers include Sports Illustrated’s The Football Book, Life 75 Years, and Kostya Kennedy’s 56: Joe DiMaggio and the Last Magic Number in Sports. THEI also publishes a range of books under licensed third party brands from MAD magazine to Guitar World. I was provided a copy of TIME For Kids’ Big Book of Where to facilitate my review. The opinions and views are my, and Kaden's own.